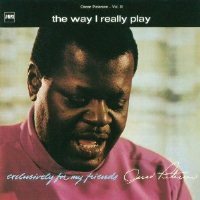 Between 1965 and 1968, piano virtuoso Oscar Peterson made an incredible series of recordings called "Exclusively For My Friends" in the private home of MPS producer Hans Georg Brunner-Schwer in front of a small number of invited guests. Brunner-Schwar rolled the tapes and recorded these intimate sesions with superb sound quality. The Way I Really Play captured Peterson at his powerful peak with bassist Sam Jones and drummer Bobby Durham. Interestingly, this single-layer, SHM-SACD was sourced from the same DSD masters used for the Universal's hybrid SACDs released in 2003. However, the direct comparison reveals an incredible sonic differences. The SHM-SACD sounds far more powerful, open, and more analog-like, with the piano sounding bigger with a fuller sonority and the drums sounding sharper and more explosive. Even if you own the 2003 hybrid SACD, like myself, it is well worth purchasing this incredible SHM-SACD version! Recorded April 1968 in the private home studio of Hans Georg Brunner-Schwer in Germany. Originally released by MPS. This limited SHM-SACD was sourced from 2003 DSD masters produced by Universal Germany.